We love to hear from our Harlaxton alumni and find out where life has taken them. Have you continued traveling? Did Harlaxton make a huge impact on your life? Have you been back to Harlaxton since you first studied at the manor? Keep in touch! Let us know where you are and what you’re doing. We are especially looking for your photographs and memories (at least those you are willing to share!) to collect in the Harlaxton College archives. You can send yours to Linda Dawes, the college Librarian. And we want to keep in touch with you. Join us on Facebook. Send us your current email by writing to the College Secretary, Anne Hollick. We’ll let you know what current students are experiencing and what’s happening at the Manor. And don’t forget about the Harlaxton Society! There’s no better way to stay involved with Harlaxton than to become a Harlaxton Society member. Pass it on. Recruit a student. Tell your story of how Harlaxton changed your life. Consider giving to scholarship funds or projects to improve the manor. 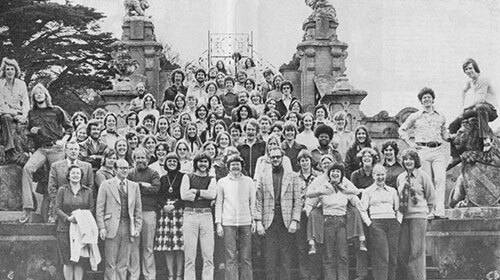 Stay a part of the continuing tradition of the Harlaxton Experience.